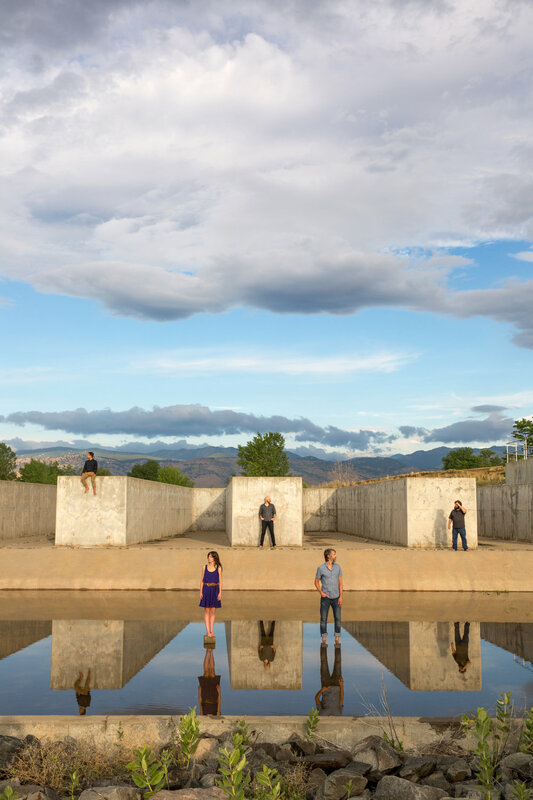 Hailing from the Rocky Mountain front range in Boulder, CO, the Railsplitters spend their time on the road appealing to audiences all across the US and Europe. Their line-up features Lauren Stovall and her 'Emmylou-esque' vocals in the lead, Dusty Rider's melodically intricate banjo licks, Peter Sharpe's Brazilian and bluesy flare on mandolin, Joe D'Esposito's New-England and Italian inspired fiddling and the ever-so-groovy Jean-Luc Davis on the double bass. Lauren Stovall, vocalist, guitarist, and composer, born in Mississippi, fostered a connection with music before she could walk. As a child, she took part in the rich musical tradition of the south and from there, expanded her musical reach, both across genres and across the US. In 2005, she found her home in Colorado amidst like minded musicians, determined to enliven their community by way of American music. It was in the Rocky Mountains that her voice and musicianship encouraged a thriving bluegrass community to welcome her in. This connected Lauren with her fellow Railsplitters and put her on a path toward finding her own place in the future of this music. She has since graced the main stages of the many of country's largest folk festivals, and has enthralled audiences across the US and abroad. Lauren uses her musicianship and virtuosity as a vocalist to connect with audiences of all ages while conveying the need for social change and equity. Mandolinist and composer, Peter Sharpe, was born in Brazil and grew up in Greenwich, Connecticut. He has been playing stringed instruments since age 12 when he was drawn to the electric guitar. He played electric and acoustic guitar in a variety of bands throughout high school and college before quite literally finding a mandolin under the bed. The mandolin was an old Gibson A style, purchased by his great-grandfather, and largely neglected since that time. He became quickly obsessed with learning the history and technique of the instrument and was pulled into the world of bluegrass and American folk music. Peter came to Boulder, Colorado in the late 90's and divided his time between rock climbing, skiing, and playing music. While in Boulder he earned his Masters degree in Counseling Psychotherapy and worked extensively with adults, teens and families. While still working full time as a therapist, Peter performed in several local bands, before meeting his fellow band members at a friend's weekly bluegrass pick. The chemistry in the group was undeniable and after a few years of playing part-time, he dedicated himself to touring full-time with the band. His background in psychology continues to inform his approach to music and composition. When he's not playing music you will likely find Peter backcountry skiing in Rocky Mountain National park, or riding his mountain bike and trying not to break his hands. Banjoist, Dusty Rider, grew up in rural upstate New York, and started playing banjo at the age of 13. He studied music education at the Crane School of Music, playing bass trombone under the tutelage of Dr. Mark Hartman, in addition to studying composition. While in college, Dusty traveled to Alaska, where he helped form his first bluegrass project, High Lonesome Sound. Through that project, Dusty was presented with opportunities for public performance on the banjo, culminating in an appearance at a banjo competition where he took first place on three-finger style and clawhammer. Dusty moved to Colorado in 2011, where he met fellow bandmates Lauren Stovall, Leslie Ziegler, and Pete Sharpe. As a member of The Railsplitters, Rider has appeared on the main stage of festivals such as Rockygrass, Grey Fox, and DelFest. With the band, he has also taught at a variety of workshops, camps, and school appearances. Dusty teaches beginner through advanced classes on the banjo for adults and kids alike. With three Bluegrass Camps for Kids under his belt, Dusty has also taught at Nimblefingers Bluegrass and Old-Time Workshop in British Columbia, and co-taught a band workshop with a middle school string ensemble and symphonic band. Dusty has recently accepted a post as a faculty member at the University of Northern Colorado Greeley where he will be helping to start and develop a bluegrass major at the school. On his days off, Dusty enjoys flying over the mountains of Colorado and dodging cars on his bicycle. Joe D’Esposito started playing violin at the age of seven and as a young teen, studied with Earl Maneein, a multi genre violinist whose projects include classical chamber music, jazz, bluegrass, and metal. Joe was raised in a musical family that gave him constant exposure to American jazz, Celtic, rock, bluegrass, and classical performances, in a family band setting. These experiences fostered a love for performance in a wide variety of genres. Joe went on to study violin and music education at Ithaca College under Susan Waterbury. It was in Ithaca, NY where doors began to open for Joe with Celtic, bluegrass, and contemporary string band music. He continually strives to expand the reach of music and education to those not ordinarily lucky enough to have it as part of their lives. Outside of his role with The Railsplitters, Joe is a Denver-based music educator and collaborator. His education background has opened doors for him as a teacher with Denver’s community musical school, Swallow Hill; His work for the music school includes group lessons, as well as work with many of the outreach programs, that Swallow Hill’s non-profit, community engagement component are based upon. He also frequently performs and composes with guitarist, Mike Robinson and double bassist, Andrew Ryan, as the Freewheel Trio based out of Denver and New York City. Born and raised in Colorado, Jean-Luc Davis picked up the bass at the age of fifteen so he could be in his high school’s jazz band. His love for music exploded and soon he was performing with his friends in coffee shops, clubs, and on the radio. During this time, Jean-Luc was invited to participate in the inaugural session of the Colorado Conservatory for the Jazz Arts (CCJA) by drummer/educator Paul Romaine. Jean-Luc went on to study classical music performance at the University of Nebraska Lincoln. As a college student, he became enamoured with the idea of playing creative music on the outskirts of established genres, a tenet that continues to guide his musical journey today. Upon his return to Colorado, Jean-Luc found himself performing alongside such creatives as; Ron Miles, Jayme Stone, Jake Schepps, Aakash Mittal, Shane Endsley, and Art Lande. Currently, Jean-Luc Davis works with a handful of private students and has become a regular teacher for CCJA. When he’s not making music, you can find Jean-Luc pondering life, love, and happiness over a cortado at one of Denver’s 3rd wave coffee shops.